This is a low-/no-pressure space for male-bodied humans to have private creative time in stunning pastoral Vermont within the intimate, nurturing mandala of the Art Monastery. are the rich offerings of this seasonal time. A unique opportunity to gather men together in a dynamic live/work studio setting to examine gender conditioning through a deepening commitment to art-making, personal transformation, and social justice. This residency program is designed to offer you just enough structure to take your creative project to the next level. All of these offerings are optional and not required. The retreat is set on 7 acres of land over looking the Connecticut River. There will be plenty of outdoor spaces for moving, creating sound, or finding inspiration in nature. and enjoy a $100 discount. Artists* who identify as male. * We believe everyone is an artist. Whether you are all curiosity without an iota of experience or you are a seasoned professional, this week offers you the opportunity to develop your skills and, with the support of a community of like-minded creatives, accomplish more than you thought possible. The Art Monastery hosts visiting artists of all disciplines. 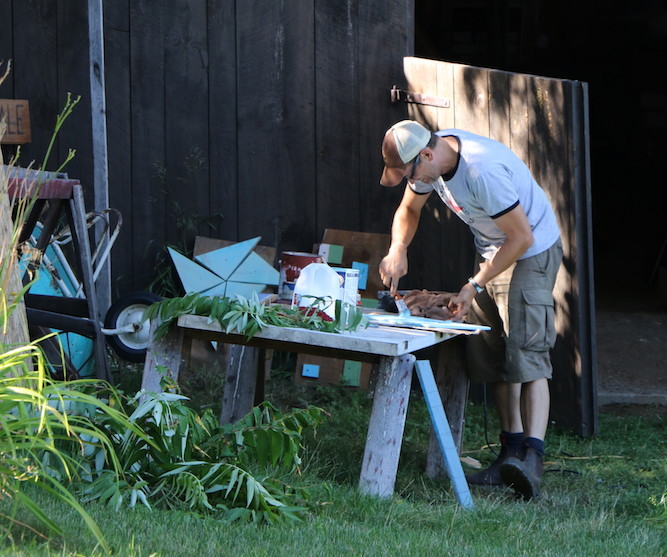 Work spaces are available for soundmaking and for quiet, for visual art and dance/theater movement, in addition to the excellent outdoors landscape of our Vermont location. Artistic feedback and contemplative support is available in one-on-one meetings with the Core Team, as well as a group share at the end of the week. A truly special 7-acre farm on the banks of the Connecticut River, we will live in the 8-bedroom farmhouse. Sleep in a shared room, work in shared studio space. Upgrade to a private sleeping space (according to availability) for an additional $75. To apply, fill out the online application below. You will hear from us within 2 weeks. You may upgrade to a solo room for an additional $75. Solo rooms also have a writing desk or table. Early Bird discount: Receive $100 discount when you apply, register, and pay in full by October 5. Extended Residency discount: Receive $100 discount when you add any two residency weeks together.